Excalibur Hotel & Casino, the world’s most exciting resort, is a magical castle. The moment you step across Excalibur’s drawbridge, you are immediately transported back to the mythical days of King Arthur. 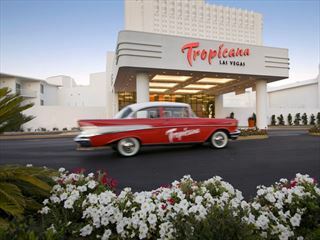 This resort features distinctive restaurants, Australia’s male revue "Thunder From Down Under", "Tournament of Kings" dinner show, two magic motion film rides, dozens of shops, Fantasy Faire Midway, Royal Treatment Spa & Fitness Centre, and more than 100,000 square feet of gaming excitement. This amazing hotel is located in the heart of Las Vegas' strip, meaning you'll be right in the hustle and bustle of casinos, restaurants, and wild attractions. 3,990 Guestrooms and Suites. The rooms feature warm, comforting tones and hardwood furnishings. Its the perfect place to relax and prepare for your next adventure. Hotel rooms feature cable TV, hair dryers and irons. Choose from a tower room with one king, or two queen-sized beds, or celebrate our castle theme with a one-of-a-kind Turret Room. Upgrade your room with a stunning view of the Las Vegas Strip or take a look at the new "Widescreen Room" - remodeled floor to ceiling to include bright, contemporary colors, granite countertops, pillow top mattresses, 42" plasma TVs and an iPod input. On the ever-changing Las Vegas restaurant scene, Excalibur’s dining options remain famous for value, variety and a full serving of the extraordinary. Rountable Buffet - It’s the king of Las Vegas buffets. Feast on a bountiful selection of entrees that are certain to please your palate. The Steakhouse at Camelot - Enjoy dinner at the quintessential Las Vegas steakhouse. The Zagat Award-winning restaurant offers the finest cuts of beef, along with the freshest seafood flown in daily. Regale Ristorante Italiano - Enjoy zesty food and festive fun. The menu features traditional favourites - pizza, pasta and lasagna - along with house specialties which include shrimp scampi, chicken and veal. Village Food Court - For a quick bite to eat while exploring Las Vegas, stop by the Village Food Court. The hotel has doubled the size of the pool, adding cabanas, a fire pit, sun decks and a secluded relaxation pool. And the new poolside restaurant, DRENCHED, is the perfect place to quench your thirst, and your appetite. At Excalibur you can get out of the sun and have some fun in one of our new cabanas. The cabanas comfortably seat five people. There are ten cabanas designated for those travelling with children, and seven cabanas available around the 18 years and older adult pool area. Excalibur offers everything you’d expect from a Las Vegas casino, with an extra dose of fun and friendliness. At the castle, you’ll enjoy your favourite slot and table games, an action-packed poker room, a full-service race & sports book, and live keno around the clock. Tournament of Kings - Don’t miss the most popular Las Vegas dinner show, Tournament of Kings. Invading armies! Dancing maidens! Jousting! Fireworks! And eating with your fingers! Thunder From Down Under - It’s a Las Vegas bachelorette party every night! Direct from Australia, it’s Thunder from Down Under! You’ll laugh! You’ll stare! You may even faint! These guys will give you something to write home about! Get ready to party with the hottest blokes in town. The greatest city in Las Vegas! 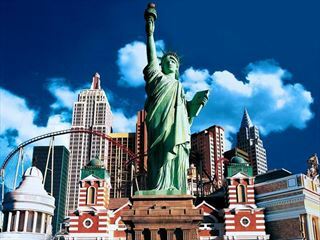 This theme-style resort is a classy art deco flavoured rendition of New York’s 12 greatest buildings in one-third scale. 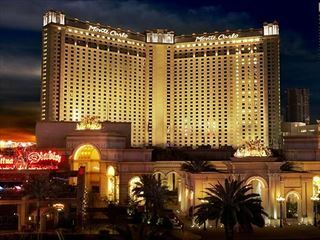 Enjoy fantastic views of the strip from the tallest hotel in Vegas. With elegant decor reminiscent of the world-renouned Monaco playground, Park MGM magnificently combines European refinement with American dazzle. Its ideal location offers immediate access to all of the action, excitement and entertainment of the world-famous Las Vegas Strip.